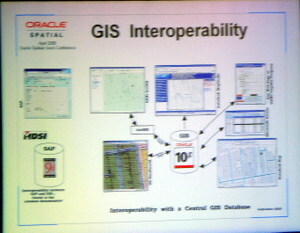 Thursday I participated in the Oracle Spatial Users Conference. It seemed to me that this was the best attended Oracle Spatial User Conference yet. There were a number of very interesting talks, but two of them struck me as not only interesting, but also important and relevant for the broad geospatial community because they were indicative of a major technical advance becoming a reality. Both the City of Tacoma and the City of San Jose in their respective presentations described deployed municipal IT systems that shared geospatial data stored in Oracle Locator or Spatial among applications from multiple vendors. In the case of Tacoma, this involved applications from Smallworld, ESRI, and Autodesk. The City of San Jose shares its geospatial information among applications from Intergraph, Autodesk, Bentley, ESRI, and MapInfo. In both cities the IT folks that implemented geospatial data sharing had to be creative, but the bottom line is that it works. The City of Tacoma was represented at the conference by JR Smith, who gave a presentation entitled "Achieving GIS Interoperability is Like Getting PIGS to Fly", which in itself indicates that creativity is required. In both cases the key was assigning a custodian for each data item. It was interesting that the challenge was not sharing the spatial data itself, but managing the metadata about the spatial data. Metadata is vendor-specific and is managed by each vendor's application. Another challenge was annotation, which is the subject of a revision working group (SFS RWG) within the OCG. But for me the writing is on the wall, organizations are sharing data among multiple vendor applications using Oracle Spatial. When JR Smith explained to the audience that PIGS stands for Productive Interoperable Geospatial System, it became clear that Tacoma and San Jose have shown the way and that PIGS can fly. At GITA 2006 yesterday I witnessed a major milestone for the geospatial world thanks to the Open Geospatial Consortium (OGC). Ten vendors in the geospatial arena viewed and updated shared maps. 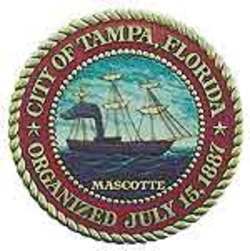 In alphabetical order, ASA, Autodesk, Bentley, eSpatial, ESRI, Intergraph, Ionic, Oracle, Safe Software, and Telus participated in a demonstration of a disaster management scenario that starred the City of Tampa. Replete with news casts and simulated oil spills and noxious gas clouds, the demonstration showed how geospatial data could be shared live among geospatial products from most of the major vendors using open web services standards WMS/WFS/GML defined by the OGC. Not only was the demonstration extremely well presented, but the fact that OGC was able to achieve the cooperation of so many vendors is a remarkable accomplishment. Congratulations are due to the OGC and its members in general, and to Greg Buehler in paricular, for enabiling this to happen. It clearly showed the potential benefits of geospatial interoperability. 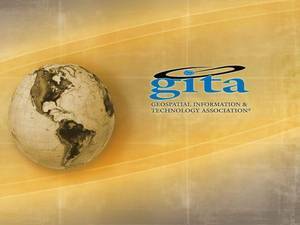 This week I am at GITA's annual conference and exhibition, this year in Tampa, Florida. I spent about four hours yesterday as one of the presenters in a seminar on spatial databases. The other presenters included Xavier Lopez of Oracle, David Maguire or ESRI, Jay Stinson of Intergraph, and Scot Rogers of Powel-MiniMax. Brad Lawrence of ENMAX was scheduled to be there as well, but his flight was delayed so I filled in for him, which is hard to do because Brad just exudes power utility experience. Last year for this seminar we had 56 attendees, if my memory serves me. The room was packed this year as well and the people I talked to thought that attendance was up from last year. This was a Sunday afternoon in Tampa and there were certainly plenty of other things to do, so it is clear that there is a tremendous amount of interest in spatial databases. The audience was about 80% utilities, 20% municipalities, a telco, and the Smithsonian. The audience seemed to be about 30% users, 45% application developers, 15% DBA's, and I assume the rest were geospatial managers. I recognized a couple of folks from Puget Sound Power, Las Vegas Valley Water, and City of Tacoma. Xavier gave a high level overview of spatial databases and typical solution architectures. In particular he mentioned that there were different approaches to sharing spatial data, which I would characterize as loosely and tightly coupled. Oracle emphasizes the advantage of a single point of truth, basically a centralized spatial database, which supports tightly coupled applications and can contribute to loosely coupled applications. David Maguire focussed more on loosely coupled architectures and discussed some alternative distributed architectures based on database replication. He also discussed versioning and locking strategies and it was heartening to see that long transactions and versioning have become a central component of mainstream GIS. I remember the first VISION* solution incorporating versioning, in 1994 I believe, and how difficult it was in those days to convey the business advantages of long-transactions to GIS folks. There was a bit of confusion over versioning support in RDBMS's during question period when a member of the audience asked David if ESRI planned to continue to support ESRI's own implementation of versioning in ArcSDE since the RDBMS vendors would increasingly provide this functionality. I was afraid that some folks might have gotten the impression from David's response that the RDBMS vendors wouldn't be doing this any time soon. Oracle for one has supported long transactions and versioning for several years in Oracle Workspace Manager, which Autodesk and, I believe, Intergraph customers are using successfully. I focussed on common business probems facing the utility and telco industries arising from their current business processes (see my first blog), including the as-built problem, problems with the flow of information with the field force, islands of information, and multi-vendor application environments and how a spatially-enabled RDBMS is a necessary foundation for solving these problems. Jay Stinson discussed a very interesting example of an application using a spatial database that Intergraph implemented for a customer, and Scot Rogers discussed how they used spatial databases in building solutions for their customers. To wrap-up Xavier asked for some feedback from the audience and my impression was that folks were very positive and felt that they had got a lot out of the seminar. Personally, I hope the participants left with one thing firmly in their cranium, that sharing data is good because it facilitates solving a lot of business problems. I just returned from Malaysia, where I participated in the National Conference on Geospatial and Mapping Solutions conference, held for the second year on Pangkor Island. The focus was infrastructure including highways and roads, municipal infrastructure, power grids, and cadastres. First a little about Malaysia. 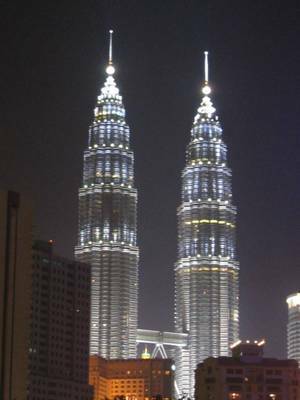 Next year 2007 is the 50th anniversary of the independence of Malaya. In 1963, Malaya was joined by Sabah, Sarawak, and Singapore to form Malaysia and in 1965 Singapore became an independent country. The population is close to Canada's, nearly 30 million, but its land mass is about half of Saskatchewan's or a bit larger than New Mexico. It's ethnically diverse, primarily Malay 50.8% and Chinese 23.8%. It's diverse with respect to languages; Malay, Cantonese, Hokkien, Mandarin Chinese, English, Tamil, indigenous) and religions; Islam (60.4%), Buddhism (19.2%), Christianity (9.1%), Hinduism (6.3%), and others. Based on what I heard, the things that were upper most in people's minds at the conference were education and training in geospatial technology, especially in the newer model-based design tools, web mapping, open source geospatial, mobile, and 3D building models and geospatial integration. 1) Administrative tag model - Basically integrates 2D spatial with tagged information for strata. 2) Hybrid model - Integrates a 2D cadastre with topological information about 3D structures. 3) Full 3D model- Requires a complete overhaul to incorporate three dimensions. Professor Rahman's approach is based on the hybrid model and represents a pragmatic solution. For example, it supports topological queries such as what is above, below, or next to a three dimensional object. What is especially interesting about Professor Rahman's approach is that it utilizes commercial off-the-shelf products, Oracle Spatial and Autodesk Map. LI2006 Why Should the CXO Care About Open Source Geospatial ? Adena Schutzberg moderated a fascinating panel discussion on "Why should the CXO care about open source geospatial products ?" The panelists included quite a diverse group of people with open source geospatial experience including Dave McIlhagga, President of DM Solutions, Chris Holmes, Vice President of The Open Planning Project, Gary Lang, VP of Engineering at Autodesk, and Brian Timoney, Principal of The Timoney Group. Why is Open Source Geospatial Successful ? Dave McIlhagga identified two key requirements that in his opinion make open source projects successful, a grass roots developer community and a thriving business sector which relies on the technology. Dave believes that both of these are realities of the open source geospatial community. Dave made the point that open source geospatial is a "quiet reality". Most people would be quite surprised at how extensive and widespread the use of open source geospatial software is. From Dave's perspective Autodesk's support for the Open Source Geospatial Foundation has added credibility wrt the quality of open source geospatial software and has contributed to bringing open source geospatial out of the back room. Gary Lang outlined the history of Autodesk's involvement with the open geospatial community. Gary lead the internal discussion within Autodesk that lead to Autodesk's decision to open source MapGuide. Autodesk, which has of course worked extensively with corporate partners, found working with an open community a different experience. For example, there was an intensive discussion within the community about naming, what to name the foundation and what to name the projects contributed by the MapServer community and by Autodesk. For Autodesk the mechanics of the naming discussion in the context of an open community was different to what Autodesk was familiar with, but one that Gary emphasized at the end of the day was a valuable experience for Autodesk. But I think Gary's most interesting point related to applying Geoffrey Moore's core and context model to when to open source and when not. In a nutshell, core is anything that leads to competitive differentiation and context is everything else, things you have to do but that are not differentiators. From Autodesk's perspective web mapping is context, in other words it isn't a critical differentiator among the geospatial vendors. Since open source is very good at context, as Linux and the Apache web server experiences have shown, it made business sense to Autodesk to contribute its web mapping source to the Open Source Geospatial Foundation and invite other geospatial vendors to do the same. Brian Timoney offered some interesting perspectives from the perspective of a geospatial consumer as opposed to a geospatial vendor. One of the most important benefits he sees of open source geospatial software is that it is significantly easier to find developers with general IT development tool experience than with specifically geospatial development tool experience. For example, PHP developers are easier to find than ArcObjects programmers. Secondly, open source applications can run just fine on very cheap hardware so that the proportion of the IT spend on hardware is plummeting. Chris Holmes discussed the difference between open standards and open source. For example, HTTP, XML, SOAP, WSDL, WMS, WFS, GML are open standards. You can find both open source and closed source products that support these standards. Open standards ensure that the pieces fit together but say nothing about how each piece is implemented - basically, software as Lego. The implementations can be closed or open source. For example, the WS-I is an organization dedicated to ensuring that Microsoft and J2EE web services interoperate based on W3C standards for web services. In my experience, open standards attracts open source. I think it relates to Gary's point about context. Innovation is the source of market differentiation and standards always lag innovation. When you see well-developed standards you are likely dealing with context, which is where open source does well. Adena asked the panel what they saw as the barriers to the adoption of open source gespatial by the IT market. Dave pointed out that one of the problems for customers has been finding out who to talk to. The OSGEO foundation has now made this a lot easier, but he sees education still as a priority. Brian made a really interesting point, that open source is the opposite of a "drug dealer" model, that all the pain tends to be up-front. Chris made the point that many of the folks looking at open source geospatial these days are not from the traditional geospatial market, but represent the geospatial-enabling market and that many IT folks in this area often already have open source experience so that for these folks there may be less of a barrier. Gary feels that the barrier's largely mental. Most folks are already using open source geospatial, whether they know it or have admitted it, so the barrier is largely an irrational fear factor. As further evidence of this phenomenon you might want to read "The Race to Dazzle: Map Sites PIle on the Features" in the latest edition of the Wall Street Journal. I just spent three really exciting days at the Location Intelligence 2006 conference in San Francisco. This has been one of the most fascinating geospatial conferences of the year because it confirmed to me what I suggested in my last blog, that the geospatial industry is undergoing a period of major transformation. To many it is obvious that, as Dave Sonnen foresaw, geospatial has become mainstream. As a result It is benefiting from mainstream IT technologies, such as XML and RSS. As an example, one of several genuine surprises at the conference and which I believe surprised even Carl Reed of the OGC, was Microsoft's announcement of their intention to support GeoRSS, something that Carl has been involved with from its inception. The mass market geospatial sector was very well represented at the the conference including Google Earth/Maps, Microsoft Virtual Earth/Windows Live Local, Yahoo ! Local/Maps/Flickr, MapQuest, and others. Google announced the release of the Maps 2.0 API at the conference and Steve Lombardi of Microsoft was chomping at the bit to introduce V3 of Microsoft's Virtual Earth API. A third trend that was actually well represented, but not as obvious, was open source geospatial. Several members of the Open Source Geospatial Foundation including Dave McIlhagga of DMSolutions, Chris Holmes of GeoTools/GeoServer, and Gary Lang of Autodesk were present. Adena Schutzberg, who I consider to be the first of the mainstream geospatial media to recognize the open source geospatial phenomenon, moderated a very interesting panel discussion on open source geospatial and why the CXO should care about it. But in addition a surprising number of the vendors present at the conference rely on open source including geospatial tools such as MapServer to run their geospatial web applications. It has become apparent to many people in geospatial IT that 2005/2006 is a watershed period for our sector. It's not just one thing, but a constellation of things that have enabled and will continue to enable many more people, both users and developers, to use geospatial technology. Access to inexpensive geospatial data is available to anyone with an Internet connection or with an inexpensive GPS and a portable computer. The cost of acquiring geospatial data continues to drop because of GPS, satellite, and other technology. One of the most innovative approaches I have come across recently is Mapping the Neighbourhood , which is a project that relies on school children equiped with a GPS and a handheld computer to map rural villages in India. In the US a government initiative, TIGER, paved the way, but in the last year the private sector including Google Earth and Map, MS Virtual Earth, and others have dramatically increased the quantity and quality of inexpensive geospatial data available. Whether geospatial data should be free is a topic for discussion, but when geospatial data is inexpensive, as with TIGER and now with other technologies, it seems to create new opportunities. About eight months ago Google Earth, followed by others, did two things to provide access to inexpensive geospatial data. First Google provided a simple web user interface to allow users to access and navigate through world-wide geospatial data. Secondly, Google provided a web services API and a simple exchange format (KML) to allow anyone to develop geospatial applications. Web services are not new and follow in the footsteps of web services APIs have been available from other major web-based vendors like Salesforce.com, eBay, Amazon, Fedex, and others, but when Google Earth created a web services API for geospatial, it really opened the floodgates. I have heard rumours that there are 800 developers building applications on Google Earth. 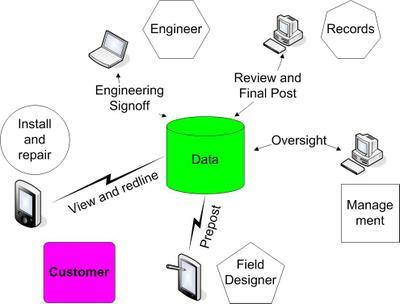 By 2005 most of the best known traditional RDBMS vendors and open source projects were spatially enabled to some degree (typically, the OGC Simple Feature Specification) including Oracle, PostGIS/PostgreSQL, DB2, Informix, and MySQL (with the ISAM engine). But 2005 saw the introduction of Oracle10g, which extended suppprt to most types of spatial and topological data including topological polygons, linear referencing systems, georeferenced rasters, and linear topology. That all of these data types are now accessible using SQL creates the basis for the open spatial enterprise where applications from multiple vendors share spatial and topological data. Oracle is just one example of the benefits of spatially-enabling existing IT tools rather than relying on traditional GIS systems. Dave Sonnen, who helps prepare the annual IDC report on spatial information systems, has been predicting for years that when the spatial-enabling market takes off, it will be much larger and grow more rapidly than the traditional GIS market. 2005 is when many people saw unmistakable signs that this was occurring. This really hit home for me several months ago when I participated in a conference in California. One of the speakers, who had obviously been a traditional GIS user for many years, explained how he had performed a geospatial operation using Oracle's geospatial analysis tools and then concluded by saying "I didn't even need a GIS." The key point is that geospatially-enabling standard IT tools and applications makes solutions conceivable for a broad range of business problems for which solutions were previously considered unimaginable. In 2005/2006 we are on the cusp of ubiquitous high speed Internet access. At least a hundred cities are planning to to completely Wi-Fi themselves. If you visit Union Square in San Francisco and have tea in one of the restaurants near Union Square, you can enjoy free municipal wireless broadband. Between 3G (UMTS for GSM or EV-DO for CDMA phones) and Wi-Fi, and in the future Wi-Max, wireless broadband access is going to be available just about everywhere. What this means for utilities, telecoms, and municipalities is that facilities data is going to not only be directly accessible in the field, but that field staff will be increasingly directly responsible for maintaining facilities data. In a nutshell, wireless broadband will enable Web 2.0 (participation) for the millions of staff out in the field. The web would not have been successful without open standards supported by the world-wide IT community. The World Wide Web Consortium (W3C) is responsible for the the key underlying standards of the modern web such as HTTP, HTML, and XML. The IEEE is responsible for standards such as 802.11x. By 2005 broad government support internationally was achieved for the geospatial standards developed through the Open Geospatial Consortium (OGC) such as WMS, WFS, and GML. 2005/2006 saw the recognition that the open source geospatial community had reached a level of maturity, especially in the area of web mapping, where in order to move forward the community decided to form the Open Source Geospatial Foundation. This enabled a major geospatial technology vendor, Autodesk, to announce support for the foundation and at the beginning of March 2006 to contribute a major code donation, MapGuide Open Source, to the Foundation. The impact of the Open Source Geospatial Foundation will be significant because it will enable a large worldwide community of open source developers to integrate geospatial technology into their applications. MapGuide Open Source provides the open source community with a next generation Web 2.0 geospatial platform for enabling participation. For organizations responsible for managing network infrastructure, this will enable field staff not only to view and markup, but also to update spatial, attribute, and connectivity data from a handheld in the field. Each of these is important on its own, but putting them all together suggests that 2005/2006 represents a major inflection point for the geospatial IT sector. Specifically for organizations responsible for maintaining network infrastructure, these things create opportunities for major advances in how facilities are managed. There are human issues that need to be addressed, but at this point it is difficult to point at technology as the reason for not moving ahead.